This tense real-life political drama about the 1973 kidnap and murder in Chile of young American journalist Charles Horman, directed by provocateur Costa-Gavras (Z, State of Siege, Betrayal), follows the efforts of the journalist's wife (Sissy Spacek - Carrie, The Coal Miner's Daughter) and father (Jack Lemmon - Some Like It Hot, The China Syndrome) to uncover the crime and bring those responsible to justice. Causing controversy upon its release (prompting the US government to condemn the film), this powerful indictment of US foreign policy went on to win an Academy Award for Best Adapted Screenplay, as well as nominations for Best Actor, Best Actress and Best Picture. Day 1 for Missing. I'll be in London - are Indicator titles sold at HMV and other retailers? If in London the best place to go is Fopp in Covent Garden. You'll also be able to pick up loads of very cheap Arrow and Criterions there too. Fopp Arrow discs are way cheaper than the Arrow sale. This should hopefully be from the recent 4k restoration which I was hoping Criterion would upgrade, but this will do nicely instead. Great to see another Keith Gordon appreciation on here. Enjoyed his apperance on the Blue Collar disc. Seems UK boutiques go through phases of releasing titles featuring a certain actor, and Jack Lemmon is the current flavour of the month* (The Apartment, The China Syndrome). Whether it's a happy accident or entirely on purpose, great to see some Costa-Gavras finally make it to these shores! *If my calculations are indeed correct, we could also see both Cowboy and Bell, Book and Candle from Indicator. Perhaps even some more Wilder - Some Like it Hot, Irma La Douce, The Fortune Cookie and The Front Page are each deserving of fresh UK discs. And of course Altman's The Player and Short Cuts are curiously vacant too (I do hope Indicator get their hands on at least one Altman title). I'm unsure then : will it use the newer restoration (which I believe is a 4K one) or an older one ? It looks like an older one but it might just be a wording thing. Apparently the 4K restoration is French funded and this maybe just Universal’s HD remaster (Indicator’s wording is very consistent and the most transparent of all the labels). Hopefully MichaelB can confirm one way or the other. Actually I was thinking it may be good that this is not the 4k restoration, because I see all the other restorations of Gavras films are tealified to the bone! And I would expect this would be too. Anyway, I watched this film 2 days ago for the first time and i found it too a trully great film! Having been through the disc myself, I'm rather impressed that despite it including no fewer than four Costa-Gavras interviews, there's barely any content overlap. The longest is a career overview, there's a half-hour piece about Missing itself, and the two short 1982 pieces discuss various contemporary issues around the film (Poland, El Salvador, the US State Department's antipathy, etc.). The extras are wonderful and completely different from the Criterion edition. Will be very happy to have this edition sitting next to the Criterion DVD edition. In all fairness, I should point out that a slightly shorter version of the French TV interview and the whole of 'Many Americas' are on the Criterion DVD - they've fused them together and presented them as an interview with Costa-Gavras. I should probably point out that the disc does mention upfront that the sound quality of the Jack Lemmon interview drops sharply in the second half, due to the final reel of the only known recording having literally decomposed. In fact, we debated cutting out the audience Q&A altogether because of this, but thought that including it but with a warning would be the best option, not least because what you can hear through the murk is so enthralling. Must say its a shame you couldn't get an interview with Sissy Spacek. She didn't participate in the Criterion DVD edition either. Jack Lemmon regarded it as the best film he made. Shame is was still around to share what would have been his current thoughts on the film. As ever in these situations, her agent was contacted, but she chose not to participate. Although the Joyce Horman interview is a more than adequate substitute, not least because she's the actual person that Spacek's character was based on, so she can discuss the performance from a genuinely unique perspective. is there really a X4 restoration around ? (in France, I can see a Costa Gavras box set by StudioCanal with "Missing" but I wasn't able to find a screenshot from this Blu-Ray). 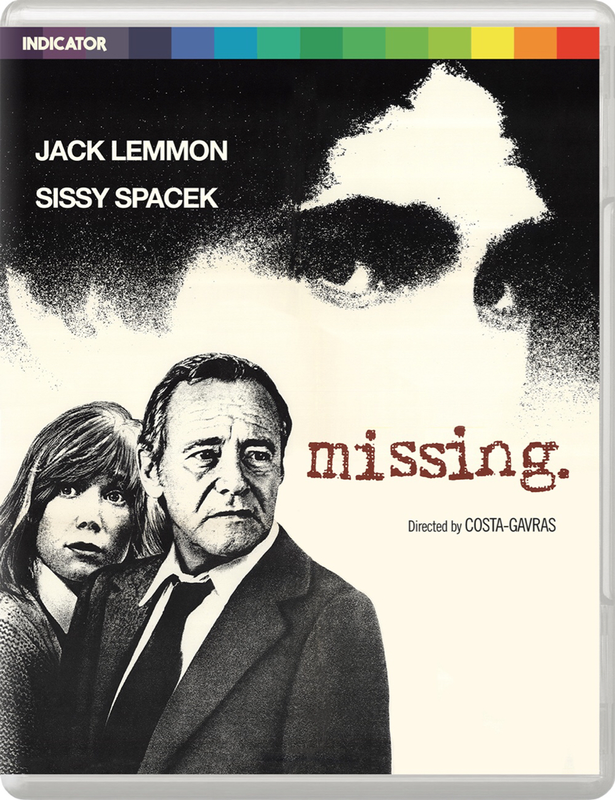 is really the Criterion blu-ray upgrade of "Missing" a "there's not hope" status now ? I remember it opens with the Universal logo; and perhaps I'm wrong, but from what I can remember Criterion was already into Blu-Ray when they put out "Missing". Unfortunately just for DVD at that time. From what I can remember, during a short era (several months), some Criterion were available both on blu-ray and DVD, and some others were unique to DVD. Not all the movies released through the recent Arte boxsets have been newly restored. Unless I'm reading them wrong (which is entirely possible), both the CineOutsider and Mondodigital reviews seem to..errr...indicate that this disc is actually region-free. Can anyone confirm this either way? DVD Beaver actually checks these things, and confirms Region B. It may well be the case that the others merely assumed that it was region-free because that's true of most Indicator releases - but this is definitely one of the exceptions. The copy I received was Region B.